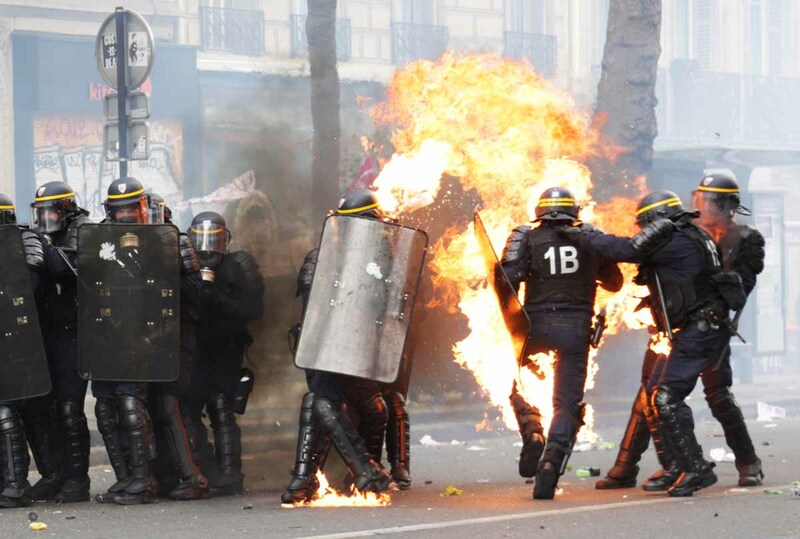 Paris -- I was really affected by this photo and by this policeman. Here was a human being on fire in front of me. In Paris. And he didn’t do anything. I am from Syria, where police aren’t there to protect you, where police shoot people at demonstrations with real bullets. 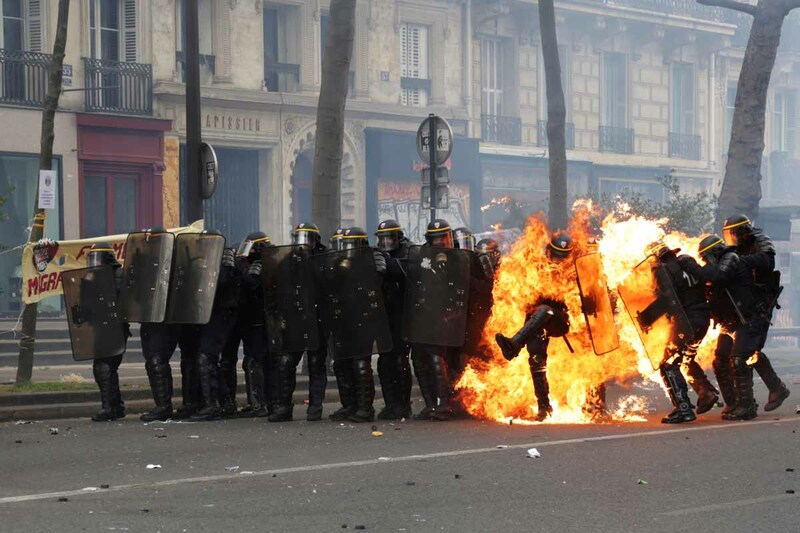 And these guys, all they did was throw some tear gas. And they were being attacked. 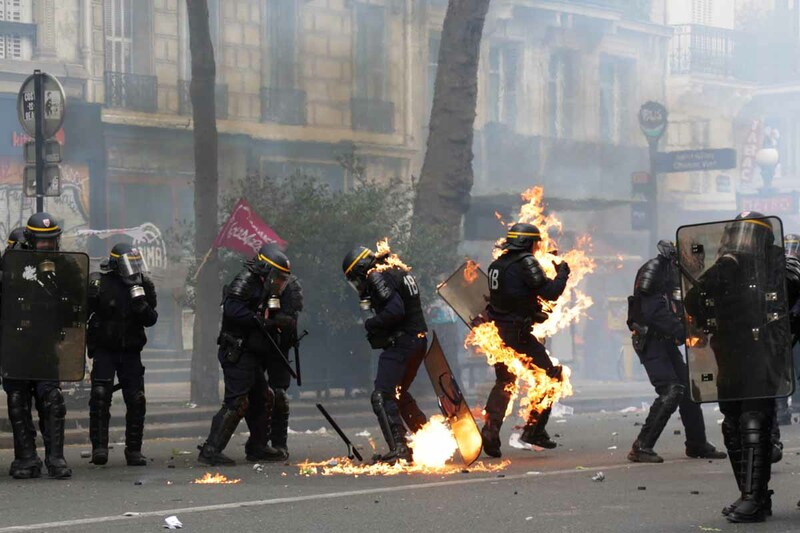 The picture was taken during a May Day demonstration in Paris, a city where I have lived for a little over a year now. I was forced to leave my hometown of Aleppo, in Syria, after I lost an eye as I took pictures of clashes. Since being in France, I have worked as a freelancer. So I go to a lot of demonstrations. I got to this one, in eastern Paris, between Place de la Republique and Bastille, around noon. I saw a lot of people, including the guys who wear black and cover their faces with bandanas, who are at all the demonstrations. I always follow them because from past experience I know they always cause trouble. They’re very violent. There have been several times when they have pushed me down to the ground and beat me. On Monday I was taking pictures of some of them as they were destroying things and one of them took a cigarette and put it out on the lens. To me, they’re more of an annoyance than anything else. I am Syrian. This is kindergarten, child’s play, compared to what I have seen. So on Monday I was following them, because I knew they would do something. I was standing between them and the police, so that I could shoot on both the right and the left. And as I was shooting, I thought how I wanted to show that the police were the victims here. Because these guys were just attacking them. They were throwing stones and glass bottles at them, anything that they could get their hands on. And all the police were doing was throwing tear gas back. Again, you have to understand. I am from Syria, where police shoot people with real bullets. And here, they weren’t doing anything. When I shoot, when I have my eye on the lens, I forget everything else. So when they threw the Molotov cocktail, I didn’t actually see it. I just saw the guy engulfed in flames and I just snapped away. It was the first Molotov cocktail that they threw. I kept on following the policeman who was burning. In that picture that went viral, he is trying to kick a tear gas canister back at the demonstrators. I heard him screaming. And the policemen around him were screaming too. I kept taking pictures until he was taken away by medics. I was really moved by the sight of this policeman. I would like to go see him in the hospital and bring him flowers. He was a human being being burned alive in front of me. And the demonstrators, they didn’t care. They kept throwing things at the police. 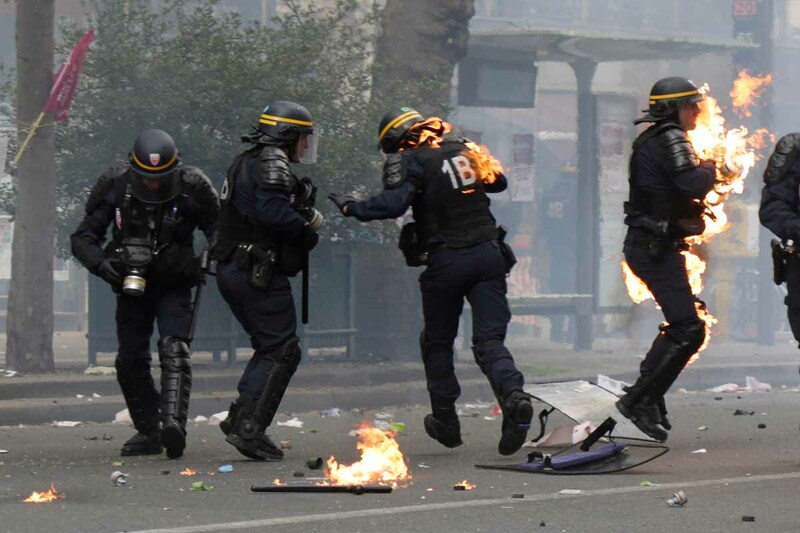 A short while later, they set a supermarket trolley on fire and pushed it toward the police. I kept thinking about his face and whether he would be scarred. I kept thinking of his family. I’ve had lots of friends who have become disfigured because they have been burned by bombs in Syria. So I know what it's like. I wonder if they do. I have seen many people die in front of me. I have seen many people wounded. But this policeman really got to me. I know what bad police are. In Syria, police are not there to protect people. I have seen them just shoot people, in the head, in the chest. Here in France, they are here to protect people. At this demonstration, they didn’t do anything, just threw some tear gas. And he is a human being and is being burned alive. And if someone is not affected by this, then he is not a human being himself. And I say this having been on the receiving end of their kicks. In previous demonstrations, some police beat and kicked me. But I was standing right in the middle of the demonstrators and frankly, I would have done the same if I were in their place. I came to Paris in December 2015. In September that year, I lost my eye in Aleppo. I was trying to take pictures of rebels who were encircled by the regime and who were trying to fight their way out. I was standing in the doorway of a building taking pictures. I kneeled down to get a better angle. And that’s when the sniper’s bullet hit me. It ricocheted off the door behind me and pierced my right eye. Luckily the sniper was up above, so the bullet hit the eye from above, vertically, instead of going inside my head. And luckily it was my right eye. You see, I take pictures with my left. So I was still in business, if you will. I was never really bitter about losing an eye. In Syria, all my friends and I knew that we would either end up dead or wounded. It was one or the other. So I became the photographer who lost an eye. I accept it and am carrying on with my life. The first three months here in Paris, I was depressed, I was in and out of the hospital for my eye. But now? Now I have friends here. I like Paris. It reminds me of Aleppo. When I travel to other cities in France, I want to get back to Paris. I was interviewed on a television show and after that, sometimes people in the metro would stop me to say, “Oh, you’re Zakaria.” I am starting to feel at home here. I am starting a new life. My refugee application has been accepted. I have applied for my wife and two children, a girl of six and boy of three, and for my parents to join me here. They are all in Turkey right now. Of course I miss Syria. It’s my country. But my country as I knew it is finished. My Syria is gone. That’s why I am starting a new life here. France helped me. And I want to give something back. This blog was written with Acil Tabbara and Yana Dlugy in Paris. Photographer based in Paris, formerly Syria. From streets of fear in Mogadishu to "paradise in Paris"